Free Kronberg from hordes of monsters! - In the north of the Kingdom of Kronberg an ancient volcano has awakened, and evil creatures from the deep burrows, marshes and swamps came out to do what they've been waiting for: to take over the country. And the war broke out over the kingdom. For each region! You, as a commander, have to get rid of enemies on the lands of Kronberg and defeat the demons at their lair. • it's really HOT in here! 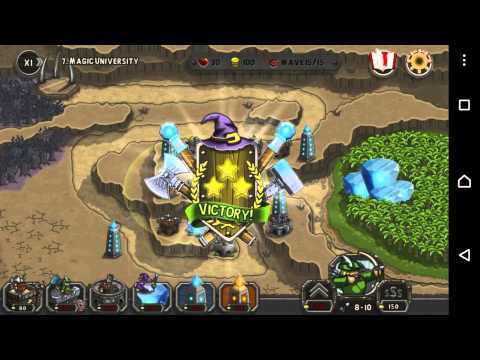 • Finally, not just towers shoot at enemies in the game, but real units, which hide behind strong walls! • The enemies are numerous and various! Rat-gnomes, skeletons, demons and slugs attack by mobs! • Oh yes, and even bosses! • 4 types of your defenders, 2 magic obelisks and more than 20 options for improving and strengthening! • A lot of interesting features on the arrangement and using fire points. • Train the defenders of the towers, place the obelisks and smash hordes of enemies! • Free Kronberg in military companies of different levels of complexity or select "survival" mode. • Do not miss the moment! First, they are quiet and small, but then they run up! Hurry up to build defense! • All of the upgrades cost the same. Improve soldiers for maximum! • Have fun! It is truly awesome!